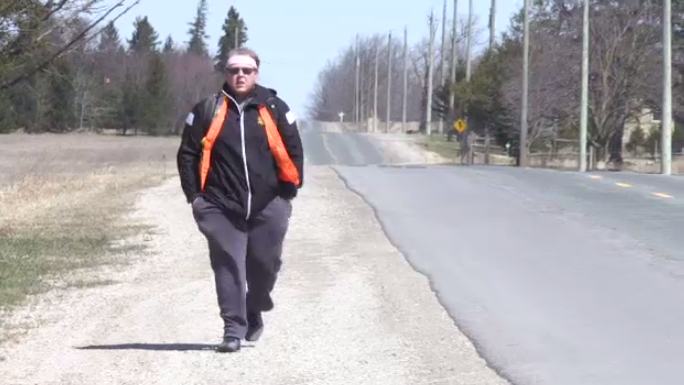 Zach Saraceni left his Kitchener home Saturday with the goal of walking to Woodstock in 12 hours. Saraceni had initially planned the walk for last October, but he was sidelined by a sports injury. That’s when he got the idea to turn that bet between friends into something more. Saraceni’s mother and his late aunt had both battled breast cancer. Seven years later, Spurgeon was also diagnosed with the disease. He has already surpassed his fundraising goal for the walk. “We’re just really proud of the guy,” said Wilhelm. Zach Saraceni walked from Kitchener to Woodstock on April 13, 2019.